Job ticket holders, Protect the impostant paper docuemtns flowing through manufacturing facility. Item CLI46114. C-Line 46114 11 x 14 inch,metal eyelet, reinforced, box of 25. 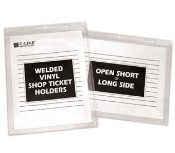 C-line 46911 shop ticket holder. Stitched plastic shop ticket holders. 8.5 x 11 shop ticket holder. 25 per box. C-Line 80058 5x8 vinyl holder box of 50. C-Line 80129 12x9 shop ticket holder box of 50. 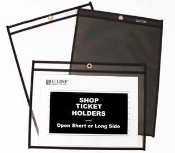 C-Line 80911 8.5x11 shop ticket holder, 50 per box. C-Line 80912 9x12 shop ticket holder box of 50. Job Ticket Holder Dual Pocket. Front side 12x9 shop ticket holder, back side 12x4.5 pocket. Stitched plastic shop ticket holder. 9x12 with a 9x6 pocket on back side of ticket holder.